Looking for "The Lake Life, well look no further! 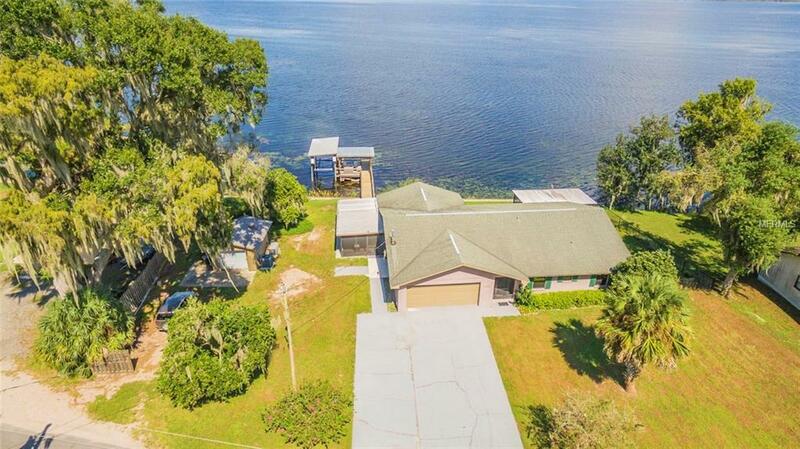 Whether its a weekend getaway from the hustle and bustle of city life or permanent residence, this gorgeous Lake Panasoffkee home has got you covered! Meticulously cared for and updated through the years, this 3BR/2BA with 2,000+/-sqft is MOVE-IN Ready. This home sits on an oversized lot with two-car garage, detached workshop, two screened lanais, and whole house generator! The dock is in great shape and comes complete with a covered seating area with suspension swing, fishing pier, and covered boat storage with electric lift! On days when its too cold or too hot to enjoy the outdoors, relax in your screened enclosed heated pool area overlooking beautiful Lake Panasoffkee. The favorite room in the home is the enclosed Florida Room which provides picturesque sunrises and nonstop wildlife views, as well as, sliding windows to bring the outdoors in. The Kitchen is very spacious with lots of counter space and cabinetry, as well as, updated Stainless Steel appliances and breakfast/serving bar. The Master is spacious and overlooks the lake with sliding glass doors that lead to pool area. The Master Bath shower was completely remodeled and enlarged with zero entry, safety bars, and bench seating. All in All, this home is ready to go for your weekend ventures or daily living. You wont be disappointed waking up to the gorgeous lake views every morning! Call or email me today!